Few things are more thrilling than overtime in a Stanley Cup playoff game: a whirlwind of zero-sum insanity. For those willing to stay up, there's nothing better on TV–or in person. This story appears in the May 25, 2015, issue of Sports Illustrated. Subscribe to the magazine here. “Bart Crashley,” says Mike (Doc) ­Emrick, pronouncing his favorite name in his favorite game. “Bart Crashley just sounds like hockey.” Emrick, of course, is the voice of hockey, so nothing sounds more like hockey than Doc Emrick saying Bart Crashley, unless it is Doc Emrick saying Bart Crashley in overtime of a Stanley Cup playoff game, for the playoffs are the highest form of hockey, and overtime is the highest form of playoff hockey, making overtime of a Stanley Cup playoff game—announced­ by Doc Emrick, with the urgency of an ­auctioneer—the quintessential hockey spectacle. Bart Crashley played 140 games as a defenseman in the NHL without ever reaching the postseason. Doc Emrick spent seven years in the bushes before calling his first NHL game in 1980 and has since worked countless playoffs. As the lead play-by-play man for NBC Sports’ coverage of the league, he is so canny and grizzled he can smell overtime coming. To him, overtime smells like Skippy, but only because a ­peanut-butter sandwich, prepared by a network staffer, appears unbidden ­before Emrick late in the third period of every close game he calls. Fortified with a first-grader­’s lunch, Emrick called the Game 7 overtime between the Rangers and the Capitals on May 13, won by New York when center Derek Stepan wristed a rebound past Washington goalie Braden Holtby 11:24 into the extra period. “Some nervous eating going on right now,” Emrick said of his viewers and himself, for what is more excruciating, even for a neutral, than hockey sudden death? 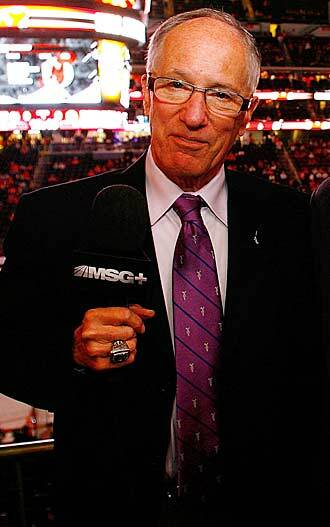 Announcer Mike (Doc) Emrick of NBC Sports. 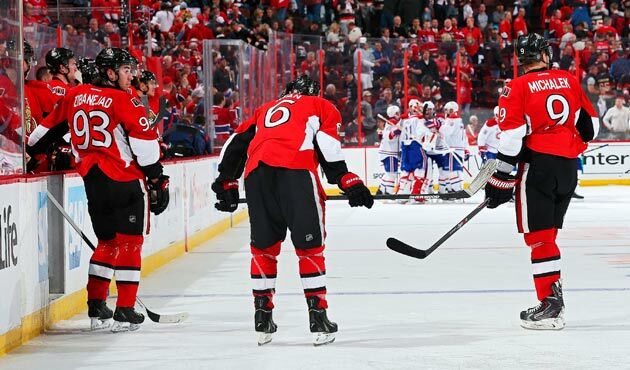 The Senators watch the Canadiens celebrate after Montreal scored in OT of Game 3 in their first-round series. Sudden death is not always sudden and never deadly. Sudden? In 1936 the Montreal Maroons and the Red Wings played six overtime periods in a game that lasted 176 minutes and 30 seconds. Death? The Canadiens won 10 consecutive overtime games in the ’93 playoffs, one more life than a cat for goalie Patrick Roy. As happens when mortality impends, everything intensifies in sudden death. Forechecking becomes fivechecking, five holes become six holes. Goals are often scored by men you’ve never heard of and may never hear from again. And so Sabres center Dave Hannan beat Devils goalie Martin Brodeur in the fourth overtime of a scoreless Game 6 in their first-round playoff series in 1994, with the game’s 120th shot on goal. “Marty would stop him 40 times out of 42,” says Emrick. “But Hannan made just the right shot at just the right time.” This good ­fortune—­Hannan had scored six goals in the regular ­season—is often called puck luck. While Emrick is upstairs eating peanut butter in OT, McGuire occupies a plexiglass booth between the benches so that he often resembles a contestant in a carnival dunk tank. Before the third overtime of Game 5 of the 2008 Stanley Cup finals against Detroit, Penguins right wing Petr Sykora announced to McGuire, in his heavily accented English, “You remember this: I’m gonna score the winner.” Nine minutes and 57 seconds later, Sykora scored the winner. 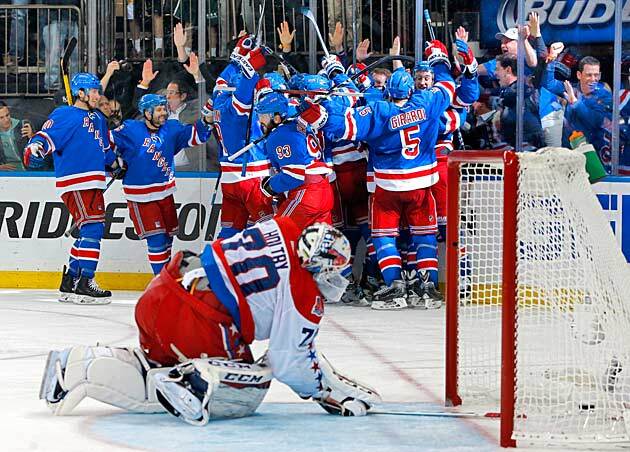 Capitals goalie Braden Holtby (70) reacts after the Rangers scored in OT to end their second-round series. The same late night that the Hawks beat the Preds in triple OT, the Caps beat the Isles in overtime, on a goal by Nicklas Backstrom, in Nassau Veterans Memorial Coliseum, which is called the barn, like every other rink in North America. “When you win as a road team, it’s gonna be quiet in the barn,” Backstrom said of his game-winner­. Though never painless, sudden death is sometimes sudden. In April, Islanders center John Tavares scored against the Capitals 15 seconds into OT, giving Emrick time to say only, “Tavares!” and—after 20 seconds of goal horn—“Bedlam­!” The shortest playoff overtime on record ended when Brian Skrudland scored in nine seconds for the Canadiens in 1986, though hockey’s most celebrated overtime didn’t last much longer. 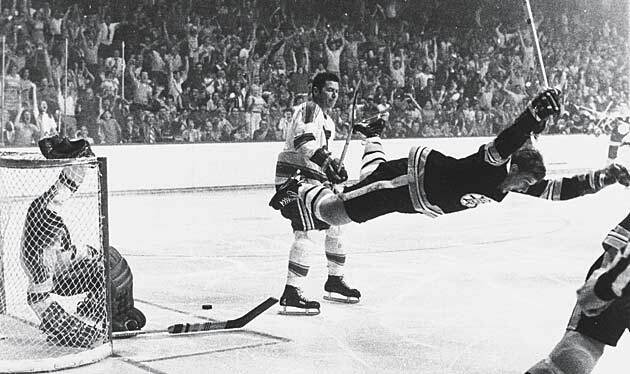 For the loser the overtime goal that ends the Stanley Cup finals is the closest that sudden death comes to real death. Except real death is sometimes a blessing, and sudden death never is. “There is zero positive takeaway from losing a long overtime game,” Clement notes. So it’s like death, but sometimes worse—a death that comes not with a white light, but a red one.